Welcome to the MAILBAG! Here are various items of lasting value that you sent and that you said you wanted added to this site. All are in chronological order, with the newest on top. To add your essays to our Mailbag, use the email link in the menu bar at the left. Put "MAILBAG" in the subject line of your email. The fine print: You must be over 13 years old to submit items to be published in the Mailbag. Please state in your letter if you do not wish your name to be included with your letter when posted here. All letters are subject to approval, editing, or rejection at the sole discretion of the webmaster. Canon. This word is very interesting when it comes to Japanese animation, or anime. Many people complain when shows contain things that are not part of the manga's plot or relative to the original story. But what if this filler, or change to the story, affects it by a tiny amount? Would it still be classified as filler? Would it still be canon? I have watched a lot of anime and cartoons and TV shows. And yet, canon is a word that rarely comes up outside Japanese animation. For example, would someone really care if the next episode of, let's say, Everybody Loves Raymond didn't connect to the previous episode? Of course not. That show is a sitcom. No one really pays attention to the plot; the whole idea of the show are the gags in it. Now, what about an anime? Let's say, Kimba the White Lion. This show works on a villain/problem of the week/ending lesson formula. A lot of shows that are popular today still use this formula. Bleach, Naruto, Sacred Seven, Fairy Tail; they all use this. And yet, if any of the story was out of place with the written version (manga) people would complain about it. Recently, there was an episode of Naruto, a show about ninjas, that was based entirely around fishing. (Yes, I'm serious.) This got the community fired up, and a lot of people complained on the creator’s Twitter account. If that had happened in the manga, Would the complaining have happened? Nope. Not at all. In 1965, Osamu Tezuka created Kimba the White Lion, based off his manga Jungle Taitei. This series showed Kimba (or Leo as he is called in the manga) as a cub growing up in the jungle. However, Jungle Taitei showed Kimba as an adult as well. At the time, NBC, the company that had bought Kimba for the US, said that if Kimba was successful (which it was) Tezuka would be allowed to create a series based on the adult Kimba. Tezuka decided to use the profits that he was making to create this series without submitting it to NBC so that it wouldn't be tampered with again. The 1965 version of Kimba was meant to be a lot darker than the one the Americans saw. There was a lot more violence in the Japanese original. This was in the manga as well. Often hiding the violence wasn't possible, and the censorship was so obvious that it became a running joke with Kimba fans. Every time that the screen showed what was clearly a corpse, people would say, "I'll just lie here and rest a moment," along with the dialogue. But the English-speaking audience never realized how much violence was toned down in Kimba's own character. In the Japanese version, Kimba was constantly struggling to maintain his ideals against his own carnivorous instincts. There were numerous incidents when it was much more obvious in the dialogue than in the action that he was on the verge of totally losing control of himself. In the episode "Nightmare Narcissus", when Roger Ranger tries to stop Kimba from attacking a doctor after Kimba realizes that he is responsible for the jungle's peril, Kimba says, "Don't try to stop me, Ranger, 'cause he endangered the animals with that horrible plant just for the sake of an experiment! I'm going to see to it that he doesn't do it again!" But what Kimba really said to Roger in the original Japanese was closer to, "Get out of my way unless you want to get hurt, too!" The next series [Leo the Lion], which came out a year later in 1966, was a bit different to the Kimba you know. This series takes place 5 years after the original series. Leo/Kimba was now a full adult and married to Raiya/Kitty. In episode 5 their children were born; twins named Rune and Rukio. As the series progressed, Rune, originally a weakling compared to the tomboyish Rukio, developed a fighting spirit and became comparable to the Americanized Kimba. The final episode had Rune saving Leo's life. It closed with a symbolic scene indicating that Leo was now ready to settle into peaceful retirement with Raiya, leaving Rune to carry on the dynasty of the white lions. That is how Tezuka viewed the series. But, In NBC's eyes, this was completely different. The jungle kingdom that had finally become a success in Kimba was reduced to a small crowd of animals, mostly herbivores, cowering under Leo's personal protection. Where Kimba had been able to beat any animal in the jungle and even leap into the air and bring down helicopters, the adult Leo had to spend almost half an episode to battle an ordinary lion or a few wolves and he might lose! There was a lot of death in the show also. This series was meant to be based off the second part of the Jungle Taitei manga. But in the manga, Kimba dies. Fair enough. Let me continue. In 1989, Osamu Tezuka died on February the 9th. Around that time, another Jungle Taitei series was made. Tezuka was only involved with the first 6 episodes, and it really shows. The violence was worse, and a lot of MAJOR characters died. Kimba even was shot in the last episode, but he didn't die. Then, in 1997, the movie Jungle Emperor Leo was released, based on the second half of the Jungle Taitei manga. In this version, Kitty and Kimba both end up dying. However, in the 1966 TV series, Tezuka made them live on. Now, a second question: Which is canon? The 1966 version which had Tezuka's involvement, or the 1997 movie? Some say the 1966 version, some say the movie. The answer to this question is up to interpretation. Tezuka made both the 1966 series, and the manga. I view the answer as the 1966 version: Tezuka made this after the manga, so he may have wanted to change it. But, I guess we will never know. My thoughts on "Journey Into Time"
There are a couple of other fascinating things in this episode. Kitty gets to save Kimba's life "Pocahontas-style". She asks her uncle (king Speckle Rex) to tell the dozen or so lions who are ganging up on Kimba to let him go. One of them is Claw, by the way, but neither Kitty nor Kimba bothers to tell Speckle Rex that he attacked Kitty a few episodes back. At first I thought this was a logical slip but I now believe it actually makes sense. Nobody cares what Claw tried to do to Kitty. This is the moral vacuum problem again. Then her uncle tells her to stay away from Kimba. This is the ultimate irony of course. Kimba is the only one there who really cares about Kitty (or about anyone other than himself for that matter) but Speckle Rex would rather she take up with Claw (no kidding). Naturally this only pushes the two of them closer together. Kitty soon crosses the line from friend to lover. And she crosses it deep. She goes way past the point of no return. She finds Kimba alone, walks straight up to him and snuggles in. Kitty does not know the meaning of the word "coy". She doesn't bat her eyes at him or invite him over for tea or anything like that – she does a full-body crush. She wants to send him a message he can't possibly misunderstand. And the message is: "I'm yours! Come and get me!" (To make sure the six-year-olds in the audience got it the animators drew a valentine vignette around the scene.) Kimba does not know how to deal with a romantic relationship and is terribly embarrassed by the affectionate advance. This leads to a hilarious miscommunication at the end of the episode where they have a conversation that goes approximately like: (Kitty) "I love you." (Kimba) That's good Kitty, you should love everybody." He misses the point by a country mile. Last but not least is Dan'ls response to their relationship. He is relieved that Kitty showed up. One of Dan'ls most important priorities is to reproduce Kimba. It is so important in fact that at the end of the episode Dan'l makes sure that Kimba and Kitty have some time alone together. Instead of hanging around to make sure the kids "play nice" he ducks out to encourage the romantic bonding. This was hot stuff back in the sixties. I don't remember what I thought of the episode "Restaurant Trouble" when I saw it as a kid, but as an adult I notice that it has a profound sub-text. The issue is the relationship between Kimba and Kelly-funt. At one point Kelly picks a fight with Kimba, but it ends "prematurely". Nobody really gets hurt but it just kind of fizzles out by mutual consent. The implication is that Kelly knows there's something wrong with fighting Kimba. Later, Kelly and the elephants get serious. They destroy Polly's restaurant and head off to do the same to Dan'l's. Before they get there, Boss Rhino has already engaged Kimba in a fight over the fate of the restaurant. When Kelly arrives it would be natural to expect him to help Boss Rhino defeat Kimba and destroy the offending enterprise. Instead, Kelly's first impulse is to protect Kimba. In fact, this impulse is so strong that Kimba must warn him sternly not to interfere in the fight. A six-year-old probably doesn't know what to make of this. An older child will figure out that Kimba and Kelly love each other – a lot. So why is their relationship so prickly? Many things interfere with giving and receiving love. Pride, fear, envy, and a long list of other negative impulses are the principal problem. Kelly is trying to be the big, tough boss of the elephants. In his circle, compromise and subordination are signs of weakness. With most opponents he has a point -– most animals are trying to take advantage of others. But Kimba is different. Kelly knows that Kimba has everyone's best interest in mind (another way to say this is that Kimba loves everyone) so it's hard to oppose him – even when he's doing something "inconvenient". 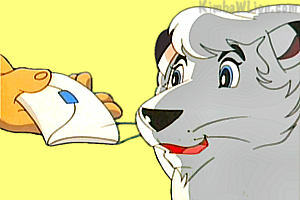 Kelly will half-heartedly oppose Kimba when his own interests are threatened, but when anyone else attacks Kimba he immediately comes to his defense. This natural ease with which Kimba gives and receives love is what makes him unique. All the other characters have some kind of defect in this regard. Kimba is not surprised by Kelly's apparent flip-flop because he understands it. And because he understands it he handles it masterfully. The only animal Kimba can't love the way he wants to is Kitty. He wants to love her the same way he loves everyone else but his body won't let him. She is the piece of the puzzle that doesn't fit, the equation he can't solve within the rules of his system of classical caritas. His concern about his own visceral reactions to Kitty is the subject of "Two Hearts, Two Minds". On the surface this is a romp with a lot of bad gags and some hilarious lapses in Kimba’s vaunted “intelligence”. Just under the surface there is a deadly serious contest going on between Kimba and Kitty. By this time their relationship has matured into a commitment. Kitty brings her uncle to see Kimba’s jungle and hopefully get his approval because this is where she will be spending her adult life – as Kimba’s queen and the mother of his children. That’s settled. What isn’t settled, at least in Kitty’s mind, is the matter of who’s going to wear the pants in the family. She abuses Kimba pretty harshly a few times and maintains a critical attitude toward him through most of the show. She is trying to break him. It’s The Taming of the Shrew in reverse. No matter how outrageous the accusation she makes against him she expects him to accept her judgement, maybe even apologize, and bow to her demands. Kimba is a bit confused by her attitude and he does accept more abuse from her than he would from any other animal. If he were an ordinary lion Kimba might have chosen the path of least resistance and become a hen-pecked husband. But he is destined to become a king and it would be impossible for him to maintain the authority he needs to govern his subjects and pursue his dream if he is not even the master in his own home. He is beginning to realize that loving a girl as beautiful, intelligent, and strong-willed as Kitty is extremely dangerous. Controlling Kitty is far and away the greatest challenge Kimba will face in his entire life. Compared to her the Destroyers from the desert were a cake walk. He can’t conquer her in one episode. It will take every ounce of courage and intelligence in his possession through his entire adolescence to subjugate her. To marry her without having that control would be worse than stupid, it would be suicidal. This page changed September 14, 2011.